I didn’t notice this quirk at all. 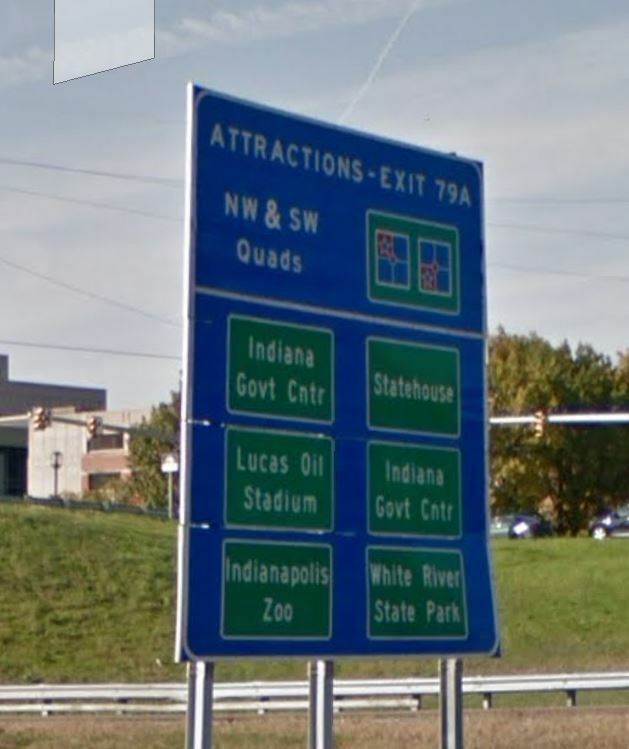 But, sure enough, Indiana Govt Cntr is listed on the same sign twice. Soon after that, we went down the list of many of the other attractions downtown that were left off due to this redundancy. I’m not sure if this says anything about anything, other than the sign makers really want people to know that this is the Indiana State Capitol. Please let me know in the comments if you know of anything else around town that is similar to this quirk. Here’s the thing: technically, this sign is correct. The Government Center is in two separate buildings, South (the three-story building fronting onto Washington) and North (the 13-story tower). IGCS is south of what used to be a street that lined up with Market and therefore in the SW quadrant, while IGCN is north, just across what used to be a street that lined up with Market, and therefore in the NW quadrant. They’re two separate buildings and although they are connected by tunnels underneath, this wouldn’t be readily known or obvious to the average visitor. Now, obviously, the sign pictured doesn’t make that distinction between the two buildings. And given that the buildings aren’t even really across a street from one another anymore (they blocked most of that off years ago), most folks wouldn’t even realize the difference without it being explained. But the pedant in my heart can appreciate that the sign is technically correct while the much more practical rest of me acknowledges that the sign is, well, dumb. Always thought that Meridian and Washington was the demarcation of the quadrants. That is the 0,0 coordinates for addressing, but the picture of the quadrants literally has the Circle in it. If you stopped 100 random folks downtown and asked what “quad” any of these attractions are to found in, I’ll bet not more than a handful would know what you’re talking about. Beyond this one sign, which most drivers likely pass by without having time to digest it all, is there any additional signage at the end of the exit ramp and beyond directing motorists to any of these destinations? If not, this sign has little value other than providing a job to its maker. Agreed, and the designations of the “Quadrants” of Downtown has been blurred by promotion of the Canal, WRSP, Mass Ave, Cole-Noble/Market East, Warehouse, Fountain Square and Stadium “districts”. There are many signs around downtown with more details about the quadrants. They are made for cars though, so peds have to crane their necks to get the info. Here is a link to one on South St in front of the post office. For reference, I am 6’4″ and my hair barely brushes the bottom of the sign. Also, that one is crooked in the picture, but is straight IRL. This is quite odd since coming from the west, the same sign approaching the West Street exit off of I-70 mentions the Convention Center in the upper left corner of those attractions. All the other attractions are exactly the same. So the sign in this picture should have the Convention Center on it, unless that’s mentioned elsewhere on the highway.